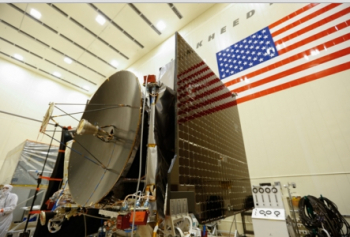 NASA’s OSIRIS-REx spacecraft has completed assembly operations at its Lockheed Martin construction site in Denver, Colorado. OSIRIS-REx, slated to become the first asteroid sample return mission for the U.S. space agency, is scheduled to launch in September 2016 on a United Launch Alliance Atlas V rocket from the Cape Canaveral Air Force Station, FL. OSIRIS-REx (Origins, Spectral Interpretation, Resource Identification, Security, Regolith Explorer) is part of NASA’s New Frontiers Program – a class of planetary exploration probes that includes the New Horizons and Juno spacecraft. In all, OSIRIS-REx and its instruments were designed to meet the mission’s five primary scientific objectives. Those objectives include: the return and analysis of samples of pristine carbonaceous asteroid regolith in an amount sufficient to study the nature, history, and distribution of its constituent materials and organic material; and to map the global properties, chemistry, and mineralogy of a primitive carbonaceous asteroid to characterize its geologic and dynamic history and provide context for the returned samples. Another scientific objective includes the categorization of integrated global properties of a primitive carbonaceous asteroid to allow for direct comparison with ground-based telescopic data of the entire asteroid population. 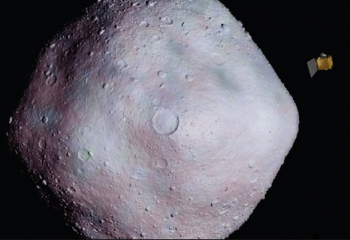 Furthermore, OSIRIS-REx is also tasked with measuring the Yarkovsky effect (the force acting on a rotating body in space caused by the anisotropic – directionally dependent – emission of thermal photons, which carry momentum) on potentially hazardous asteroids and constrain the asteroid properties that contribute to this effect. Finally, OSIRIS-REx will document the texture, morphology, geochemistry, and spectral properties of the regolith at the sampling site at scales down to millimeters. In all, the mission was developed in partnership between the NASA Goddard Space Flight Center, Lockheed Martin Space Systems, and the University of Arizona’s Lunar and Planetary Laboratory and comprises an international science team from the U.S., Canada, U.K., Germany, Italy, and France. To accomplish the mission’s scientific objectives, OSIRIS-REx is fitted with six scientific instruments: the OSIRIS-REx Camera Suite (OCAMS), the OSIRIS-Rex Laser Altimeter (OLA), the OSIRIS-REx Visible and IR Spectrometer (OVIRS), the OSIRIS-REx Thermal Emission Spectrometer (OTES), the Regolith X-ray Imaging Spectrometer (REXIS), and the Touch-And-Go Sample Acquisition Mechanism (TAGSAM). OCAMS is designed to allow for the acquisition of global mapping, sample site reconnaissance and characterization, high-resolution imaging, and recording of the sample acquisition. Adding to the detail of global mapping, OVIRS will help identify key mineral species, water, and organic materials through global survey observations. OTES, however, will provide a very different set of data to OSIRIS-REx’s flight controllers. 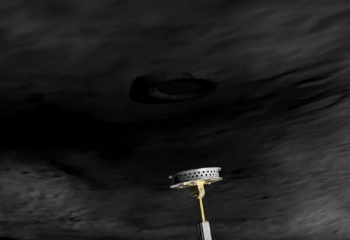 OTES will provide detailed and highly accurate temperature readings of Bennu over several times of day to create detailed thermal models including estimates of thermal inertia – the rate at which thermal energy moves through Bennu’s surface. This will help mission controllers find the loose regolith needed for sampling acquisition. Another instrument designed in part to aid in sample acquisition is OLA. During Bennu proximity operations, OLA – provided by the Canadian Space Agency – will provide dense, global coverage of Bennu’s surface as well as 5 cm resolution of proposed sample sites. 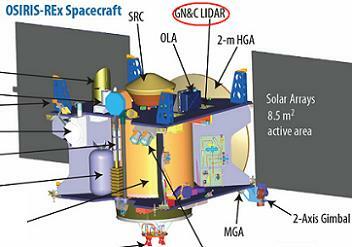 Moreover, OLA will provide independent verification of Bennu’s topography derived from imaging by other instruments. Meanwhile, the REXIS instrument – a small telescope that images X-ray fluorescence – will determine the elemental distribution and concentration in Bennu’s surface. Finally, once a suitable sample acquisition site has been located, the spacecraft will use its TAGSAM to grab 60 g or more of surface material from Bennu. OSIRIS-REx’s destination is asteroid Bennu (officially known as 101955 Bennu). With a diameter of 480 to 511 meters, Bennu completes an orbit of the Sun every 436.604 days (1.2 Earth years). Bennu, a carbonaceous asteroid, was chosen as the destination of the OSIRIS-REx mission due to its orbit, proximity to Earth, suspected composition, and desire for the OSIRIS-REx mission to return an asteroid sample to Earth that would help further humanity’s knowledge of the formation and evolution of the solar system. Specifically, scientists expect that Bennu may hold clues to the origin of the solar system and the source of water and organic molecules that may have made their way to Earth. Furthermore, investigation of Bennu by OSIRIS-REx will provide information beneficial to future efforts to develop a mission to mitigate an asteroid impact of Earth, should one be required. If all goes to plan, OSIRIS-REx will launch in September 2016 aboard a United Launch Alliance Atlas V rocket. 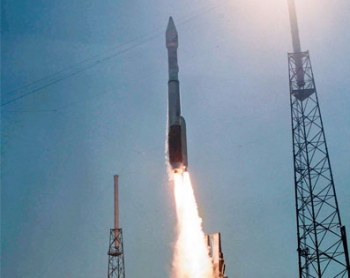 The Atlas V will fly in its 411 configuration – with a four meter payload fairing, one solid rocket motor, and a single-engine Centaur upper stage. While a precise launch date has not been determined, OSIRIS-REx has a 39-day launch window that opens on 3 September 2016. Once launched, OSIRIS-REx will leave Earth on a direct outbound trajectory with a delta-V of 1,400 m/s. 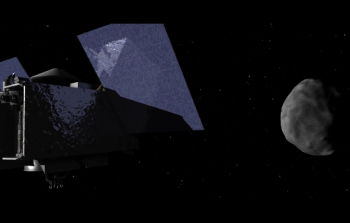 One year after launch, the craft will return to Earth for a gravity assist maneuver to place it on an inclination of solar orbit that matches Bennu’s 6-degree inclination with respect to Earth. After another year of cruise, OSIRIS-REx will begin a 68-day approach to Bennu on 12 September 2018. This will be followed by detailed surface mapping operations acquired over the course of several different orbital trajectories and passes around Bennu. According to the mission timeline, after surface mapping and site reconnaissance, the spacecraft will maneuver close to Bennu’s surface – at which point its TAGSAM will collect the samples from Bennu. This sample acquisition will take place in 2019. Once sample acquisition is complete, OSIRIS-REx will drift away from the surface of Bennu and be placed in a quiescent configuration until Bennu departure operations in March 2021. At that point, OSIRIS-REx will conduct a departure burn to begin its two year return trip to Earth. Once in proximity to Earth, the Sample Return Capsule will separate from OSIRIS-REx and land back on Earth in September 2023. Once the Sample Return Capsule separates from the spacecraft, OSIRIS-REx itself will perform a divert maneuver to send it clear of Earth’s atmosphere and place it into a heliocentric orbit. As of 21 October 2015, Lockheed Martin – the prime contractor for building the spacecraft – had completed all construction and assembly operations on OSIRIS-REx. “This milestone marks the end of the design and assembly stage,” said Dante Lauretta, principal investigator for OSIRIS-REx at the University of Arizona, Tucson. 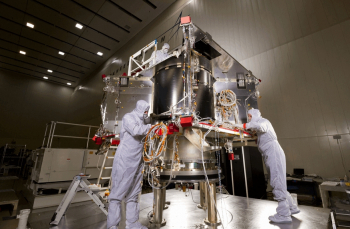 As part of this environmental testing, over the next five months, teams will subject OSIRIS-REx to a range of rigorous tests that simulate the vacuum, vibration, and extreme temperatures the spacecraft will experience throughout the life of its mission. Specifically, OSIRIS-REx will undergo tests to simulate the harsh environment of space, including thermal vacuum, launch acoustics, separation and deployment shock, vibration, and electromagnetic interference and compatibility. “This is an exciting time for the program, as we now have a completed spacecraft and the team gets to test drive it, in a sense, before we actually fly it to Bennu,” said Rich Kuhns, OSIRIS-REx program manager at Lockheed Martin Space Systems. 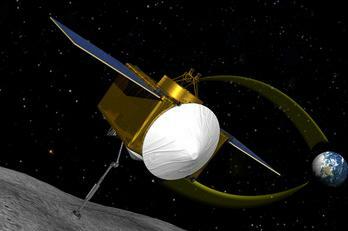 Of impressive note is the fact that OSIRIS-REx is currently ahead of schedule and on budget. This is particularly important as it provides some schedule relief should environmental testing reveal anything that needs to be fixed. Nonetheless, if all environmental testing reveals a healthy and robust spacecraft, OSIRIS-REx will be shipped from Lockheed Martin’s facility to NASA’s Kennedy Space Center in May 2016 where it will undergo final preparations for launch. (Images via NASA and Lockheed Martin).